My smug pride in the wildlife in my yard, meadow-lark at the bird bath, garter snake under the dogwood, was under-mined by a letter from my brother. "I'm going to check the barn for bears one more time, and then I'm going to bed. ", it concluded. My eyebrows shot skyward. Bears in the barn? How many bears? Why in the barn? If the bears are in the barn, where are the horses? Further information's arrived. There are six bears, a mother and her two cubs, plus three other bears, about two or three years old. They patrol the barn looking for barley and sweet feed. Which are now in the house. The horses, meanwhile, are in the corral. This probably suits Kenny, the mare. Kenny is an Alberta mustang, from one of the largest wild herds in North America. Until April she'd spent her life on the open range. Kenny's a lot more used to bears than she is to barns. One evening she walked right up to one of the bears as if whispering, "If you like that barn, you're welcome to it. I prefer being outside under the tree." Denali, Kenny's two month old colt, assumes Mother knows best. Bears, horses and humans seem to have it all worked out. My brother, his partner and their horses live on a section of our original family homestead. These bears, the Swift Creek Six, are the most recent in a long line of bears which have co-existed with people and other animals on our land. During our childhood bears were as much part of ordinary life as watering the horse or milking the cow. We were always aware of them. But the animals we were careful to avoid were the temperamental skunks. My brother continues the family hospitality. He's had a mother bear and her cubs decide during the salmon run that it was silly to go across his lawn to catch and eat spring salmon in Swift Creek, then walk the whole 400 yards back to the deep woods to rest. Not when there was a handy grove of aspen right beside the house. "Watch for the bears." was the motto when I went to visit that summer, and you bet I did. Mother and cubs sheltered in the aspen digesting. Another bear stood beside my brother's yellow Yamaha, resting its paws on the seat, maybe pondering the possibility of taking to the road. He did think the one which climbed from the porch onto the roof was carrying familiarity too far. A heavy bear might just crash through the roof. As our father used to mutter, he didn't mind bears around the house, but, when they wanted to come in and watch TV, he drew the line. None of these bears, past or present, are 'pet' bears. They aren't buddy bears, friends or companion animals. The humans who share their habitat don't talk to them, cajole them or try to turn them into Disney bears. They are totally wild animals who range happens to overlap that of their nearest human and equine neighbours. Each species treats the others with respect and gives them space. There's never been an 'incident'. A friend insists that's because the bears know better than to mess up a good thing. We think it's because our land provides a large diversity of habitat and shelter. Usually it's not crowded, although - six bears ..?? A generation ago most Canadians were familiar with bears. Now, frequently, 'country people' have just moved there from centres where the wildest creature was a Pomeranian. Traditional bear territory is being diminished as more people without any knowledge of ursine habits move into it. People and bears come into closer contact and neither one has much room to retreat. Public attitudes seem to divide into two opposite camps, neither one boding well for bears. "Kill it, it looked at me!" is the watchword of Camp A. These folks genuinely believe any wild creature larger than a rabbit is bent on murdering them and their families. Let a gopher, squirrel or marmot glance their way and they yell for a conservation officer to slaughter it. Imagine how much bears frighten them. They maintain that the only good wild animal is a dead wild animal. If the species goes extinct, well, the world's that much more peaceful. "To know me is to love me!" is the gleeful cry of Camp B whose attitudes are just as dangerous to the long term survival of bears. Bears, they insist, are not large powerful omnivores; they're the misunderstood victims of bad publicity. These people honestly feel that if we talk to bear and get to know them any problems can be avoided. They don't seem to realize that bears, even among themselves, are not sociable creatures. To Camp B adherents bears aren't wild animals with their own lives and priorities. They're seen as pals, friends or panaceas for difficult inter-human relationships. It all seems a lot to ask of a bear which has its own ursine obligations. Even dogs have a difficult time living up to these expectations and they've had thousands of year's experience with human foibles. Our family assumes that bears, like other wild creatures, want the same things we all do. Food, shelter and a safe place to raise the young. Not that the bears have everything their own way. My sister's part of the family land adjoins our brother's. To the bears it's all one. But she's much less accommodating. She prefers bears to stay away from the house. During the years she ran a plant nursery from her home she kept a gun handy ready to fire a shot in the air to frighten off any bears which might discomfit her customers. Belatedly she realized some customers, misinterpreting the weapon, might be buying more petunias and lillies than they'd intended. "Just give me a dozen more. Heck, we can always find room. We'll tear down the garage, that'll make a spot! Any other plants you recommend?" Forced to find another method of bear-proofing her yard she turned, like a good Canadian, to the C.B.C. What inspiration! 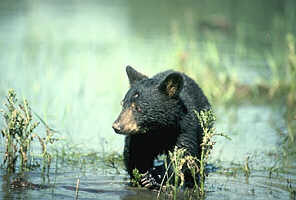 While a shot across the bow may temporarily startle a bear, to scare it away and keep it away the C.B.C. is absolutely unequalled. Visitors may be confused to find radios blaring Rex Murphy and Radio Canada International festooning crab apple trees like Salvador Dali watches, but, it works. Bears, forced to choose between Canadian culture and the peace of the forest are keeping their distance. Reluctantly, my brother's taking steps to protect the barley in the barn. At last report the Swift Creek Six, enticed by wild berries, had moved on. If they return in the fall, writes my brother's partner, "We're ready for them. We have a street lamp between the house and the barn. " "Hopefully", he adds, "it will attract bats to eat the bugs as well as keeping the bears away from the barn." That's summer on Swift Creek.